Stir together sugar, water and corn syrup and cook until 234°F (soft ball stage) in a large sauce pan. Add the butter; stir to incorporate. Add the heavy cream and salt; stirring until incorporated and salt has dissolved. Continue to cook until thickened, 1-2 minutes more, if desired. Preheat your oven to 400 degrees. Lightly oil a baking sheet. Halve a sugar pumpkin and scoop out the seeds. Place the pumpkin halves cut side down your baking sheet and roast the pumpkin until it is completely tender inside, about 45 to 50 minutes. Scrape the pumpkin flesh off the skin with a large spoon (metal is great here, because of the sharper edges) and puree in a blender or food processor until smooth. Let cool and use as needed. 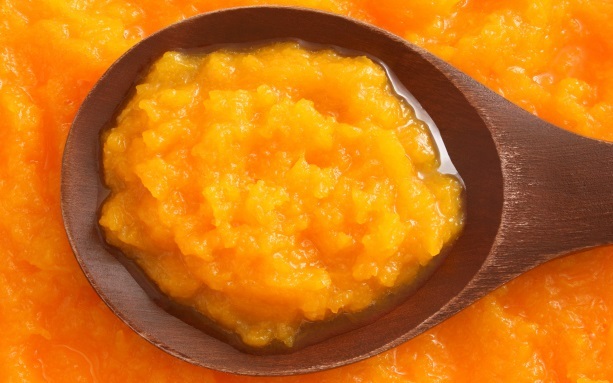 1 15-ounce can of pumpkin puree holds about 1 3/4 cups of puree. Don’t have a sugar pumpkin? Sweet potato, butternut squash and red kuri squash are all great substitutes for pumpkin puree in recipes. Sweet potatoes will roast faster and so will smaller squash, but the method is the same: halve, roast facedown, scrape the flesh off the skin and puree it until smooth. As a general rule, 3 pounds of fresh pumpkin will yield about 3 cups of mashed and cooked pumpkin. 2. Rinse the pumpkin under cool water to rid the skin of any residual dirt and dry well with a clean towel. 3. Cut the pumpkin in half. Remove the seeds and stringy fibers with a metal spoon or ice cream scoop. Save the seeds for toasting, if you like, and discard the innards. 4. Rub the cut surfaces with oil. Place them, cut side down, in a roasting pan and add 1 cup of water to the pan. 5. Bake in the oven until the flesh is tender when pierced with a knife. This takes approximately 90 minutes. 6. When tender, remove the pumpkin halves from the oven and place on a flat surface to cool. 7. Once cool enough to handle, but not cold, scoop out the pumpkin flesh. 8. Puree the pumpkin in a food processor, in a food mill, with a hand held blender or by hand. 9. Pumpkin flesh holds a lot of moisture. Line a sieve or fine mesh colander with paper towel or a coffee filter and set over a deep bowl. Let drain for about 2 hours and stir occasionally. 1. Bring a large pot of lightly salted water to a boil. 2. In the meantime, rinse the pumpkin under cool water to rid the skin of any residual dirt and dry well with a clean towel. 4. Cut the pumpkin into evenly-sized smaller pieces and peel. 5. Add to the boiling water and cook for about 25 minutes or until the flesh is tender when pierced with a knife. 6. Puree the pumpkin in a food processor, in a food mill, with a hand held blender or by hand. 1. Bring a pot of water to a boil that will hold a vegetable steamer or colander. 4. Cut the pumpkin into evenly sized smaller pieces and peel. 5. 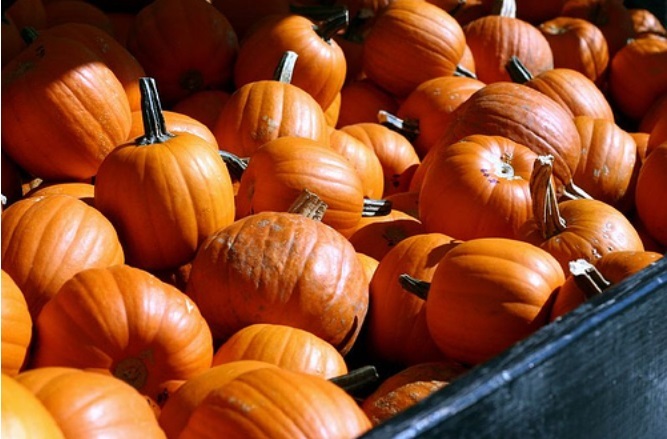 Place the pumpkin pieces in a steamer or metal colander and over the boiling water. Cover and let steam for about 50 minutes or until the flesh is tender when pierced with a knife. Once the puree has cooled entirely, place in freezer containers or ice cube trays. Leave room at the top (headspace) of the containers or individual ice cube compartments. Label, date and freeze the puree for future use. Preheat oven to 325°F, and grease a 9-inch springform pan. Carefully wrap the outside of the pan in 2 layers of heavy-duty aluminum foil, being sure that there are NO gaps where water could seep through. Using an electric mixer, beat cream cheese on medium speed for 3 minutes until smooth. Add sugar and beat for an additional minute until well blended. Add Greek yogurt and vanilla, and beat for an additional minute, stopping partway to scrape the bottom of the bowl with a spatula. Add eggs, one at a time, beating on low speed after each addition just until blended. Do not overbeat! Pour into crust. Place the double pans in the oven on a shelf on the bottom third of the oven. Very carefully use a tea kettle (or large measuring cup) to pour the boiling water in the larger pan to form a water bath around the springform, so that it comes up about 1-inch around the springform. Close the oven door, and bake about 1 hour 30 min, or until center is almost set. (The cake should still jiggle ever so slightly.) Turn oven off, and open oven door slightly. Let cheesecake set in oven 1 hour. Then remove cheesecake from oven, carefully run a knife around the edges of the cake, and then let cool to room temperature. Refrigerate at least 4 hours or overnight. 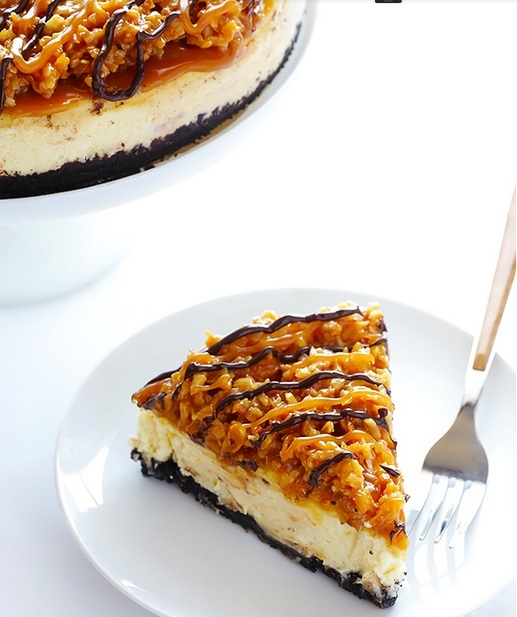 Remove springform rim, and top cheesecake with Samoa topping. Return the cheesecake to the refrigerator for at least 15 minutes for the topping to set. Then serve, or cover and refrigerate for up to 5 days. Preheat oven to 350 degrees F. Spread shredded coconut out in an even layer on a parchment-covered (or aluminum foil-covered) baking sheet. Bake for about 6 minutes, or until the top layer of coconut is toasted and lightly golden, then remove the tray and stir the coconut. Bake for an additional 3-4 minutes or until the new layer of coconut is lightly golden. (Keep a close eye on it so that the coconut does not burn.) Remove the pan, and pour coconut into a mixing bowl. 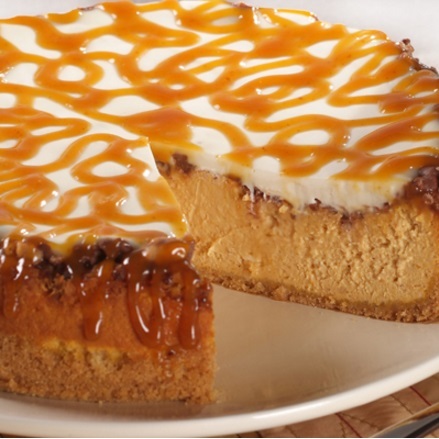 Using a spoon, spread a separate 1/2 cup of caramel sauce onto the chilled cheesecake. Then top with the caramel/coconut mixture, and press it down until the top of the cheesecake is covered. Pour the melted chocolate into a piping bag or a Ziplock bag with the corner snipped off, then pipe it onto the top of the coconut/caramel mixture in even lines. 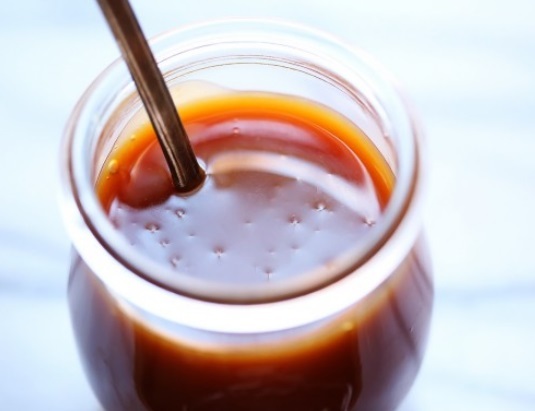 Repeat in a separate bag with the remaining caramel sauce. Whisk together the sugar, corn syrup, water, and lemon juice in a microwave-safe measuring cup or glass bowl until combined. Microwave on high for 5 to 8 minutes, until the mixture ever so slightly begins to turn a light golden color. Watch carefully—if you wait even a few seconds too long, it will turn too dark, and will thus overcook and turn slightly bitter. Carefully remove the measuring cup from the microwave and place it on a dry surface. Let it rest untouched for about 3-5 minutes, or until the mixture turns a deep amber color. Then add in about a tablespoon of the heated cream, and immediately whisk to combine. 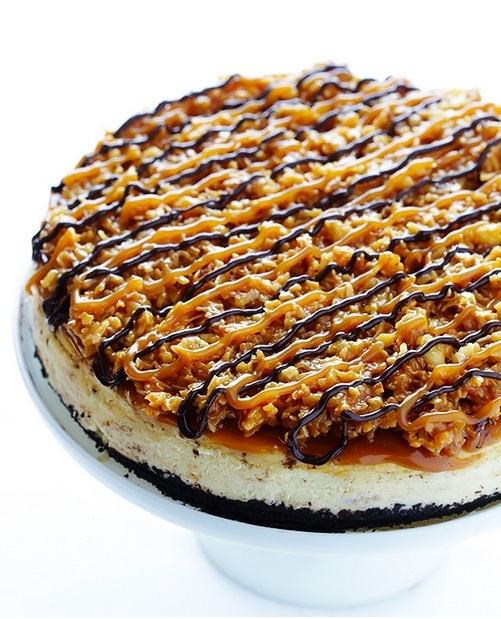 The caramel will bubble furiously, but whisking will keep it from overflowing. Continue adding the cream slowly in small increments until it is all whisked in. Then add in the vanilla and butter and whisk to combine. Serve immediately warm, or let it sit and come to room temperature to thicken slightly. Store in a jar or sealed container and refrigerate for up to 2 weeks. *Heat your cream either in the microwave or a (separate) small saucepan until warm but not boiling. 1. To make the peppermint stick ice cream, heat the milk, salt, and sugar in a saucepan. 2. Set up an ice bath by placing a 2-quart (2l) bowl in a larger bowl partially filled with ice and water. Set a strainer over the top of the smaller bowl and pour the heavy cream into the bowl. 3. In a separate bowl, stir together the egg yolks. Rewarm the milk then gradually pour some of the milk into the yolks, whisking constantly as you pour. Scrape the warmed yolks and milk back into the saucepan. Cook over low heat, stirring constantly and scraping the bottom with a heat-resistant spatula, until the custard thickens enough to coat the spatula. 4. Strain the custard into the heavy cream. Stir over the ice until cool, add the mint extract and taste, adding more if desired. Whisk in the red food coloring – since brands vary, you can add enough until it’s the color you want. (I used 8 drops of McCormick red food coloring.) Refrigerate the mixture thoroughly, preferably overnight. 5. Freeze the custard in your ice cream maker according to the manufacturer’s instructions. Add the crushed candy canes to the ice cream during the last two minutes of churning. Scrape the churned peppermint stick custard into a chilled container and freeze until ready to serve. 6. To make the hot fudge sauce, melt the chocolate and butter in a bowl set over a pan of barely simmering water, stirring until smooth. 7. While the chocolate is melting, in a medium saucepan, whisk together the powdered sugar, brown sugar, cocoa powder, corn syrup (or golden syrup), salt, and heavy cream or crème fraîche. Heat the mixture, stirring frequently, until it comes to a low boil. Continue to cook, stirring constantly, until the sauce starts to thicken, about 45 seconds. Remove from heat and whisk in the melted chocolate. 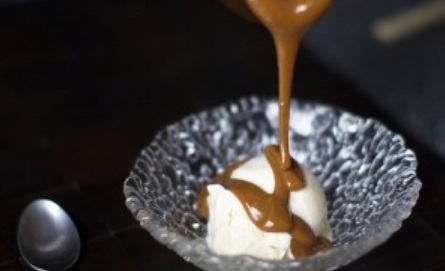 Serving: Scoop ic cream into bowls and drizzle each with a generous helping of hot fudge sauce. You can garnish the ice cream with additional bits of crushed candy canes, if you wish. 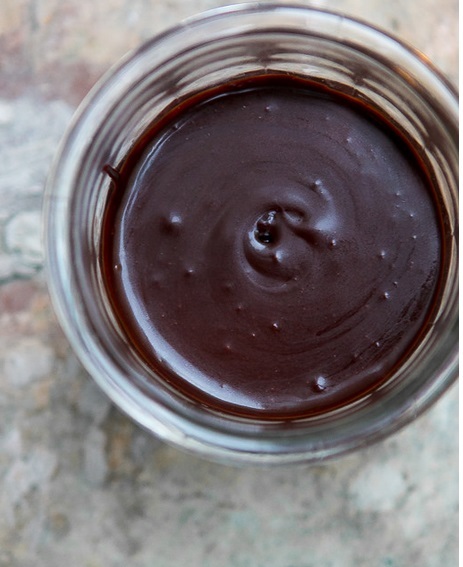 Storage: The hot fudge can be made up to one week ahead, and stored in the refrigerator. It can be rewarmed in a saucepan over low heat, adding water or milk to thin it out, if it becomes too thick. Position a rack in the center of the oven and preheat the oven to 325 F. Set 8 small (6- to 8-oz) ramekins, cups or coffee cups in a small roasting pan. Bring a kettle of water to a boil. In a medium bowl, whisk the egg yolks until smooth. In a medium saucepan over medium heat, melt together the butter, sugar and salt. Whisking often, cook until the sugar begins to caramelize, darkening in color and smelling nutty, 3 to 4 minutes. Carefully and slowly whisk in the half-and-half. 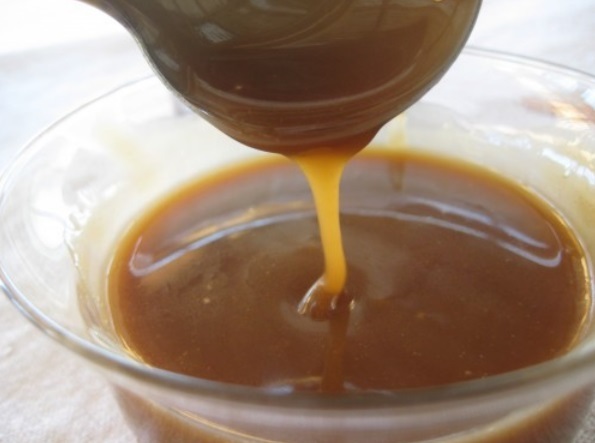 The caramel will seize at first, melting back into the mixture once all the liquid is added. Stirring often, bring the mixture to a simmer. Remove the pan from the heat. Stir in the vanilla bean paste or vanilla extract. Whisk a small amount of the hot liquid into the yolks to warm them and then gradually whisk in the remainder. Set a fine mesh sieve over a large heatproof measuring cup. Pour the custard through the sieve. Divide the custard evenly among the ramekins. Slide out the oven rack and place the roasting pan on the rack. Carefully fill the roasting pan with boiling water halfway up the ramekins, taking care not to splash any water into the custards. Slide the rack back into place. Bake until the custards are just set but still jiggle when tapped and a thin knife inserted into the center of one of the custards comes out clean, 30 to 45 minutes, depending on the size, depth, and thickness of the ramekins (use the “jiggle test” and knife tester as your clues for doneness.) Let the custards cool out of the roasting pan for 5 minutes. Cover loosely with plastic wrap and chill for 3 to 4 hours. 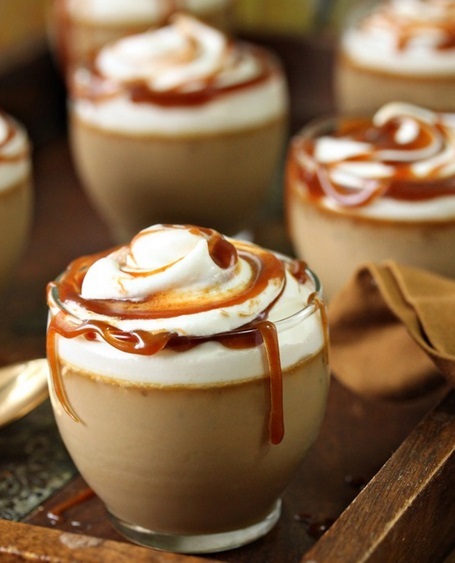 To serve, top each pot de crème with a dollop of whipped cream, a drizzle of caramel sauce, and a smattering of flaky sea salt. In a medium heavy-bottomed saucepan, gently stir together the sugar, water, honey, and salt. Set the pan over medium-high heat. Stirring gently, bring the mixture to a boil, and then stop stirring. Cook the sugar syrup until it caramelizes, about 5 to 7 minutes, swirling the pan occasionally. The color of the sugar will make it a bit tough to gauge by sight if the sugar is caramelizing, so watch for a thickening of the syrup and a few wisps of smoke coming from the pot, and keep your nose tuned in for a slightly smoky smell; if you’d like to use a candy thermometer for extra insurance, caramelization will happen at about 300 F.
Remove the caramel from the heat and whisk in the butter. Carefully whisk in the buttermilk and cream. Place the pan back on the heat and bring the caramel back up to a simmer, whisking all the while. Cook for 1 additional minute; if any lumps formed when you poured in the liquids, they should smooth out completely during this time. Remove the pan from the heat again and whisk in the vanilla extract. Chill in the refrigerator until you’re ready to serve. 1. In a 2-quart measuring cup, place the butter. Microcook on HIGH for 1 minute to melt. 2. Stir in the brown sugar, unsweetened almond milk , corn syrup, and salt with a whisk. Stir with a wooden spoon to break up any lumps in the sugar. Cover with a piece of parchment paper. Microcook on HIGH for 3 to 4 minutes, stirring once with the handle of a wooden spoon until thickened and sugar is dissolved. The mixture will come to a full boil. 3. Remove from the oven and immediately whisk in the vanilla and brandy until smooth and well blended. Dip the tip of a spoon into the sauce and carefully not to burn your tongue, taste for vanilla or salt. 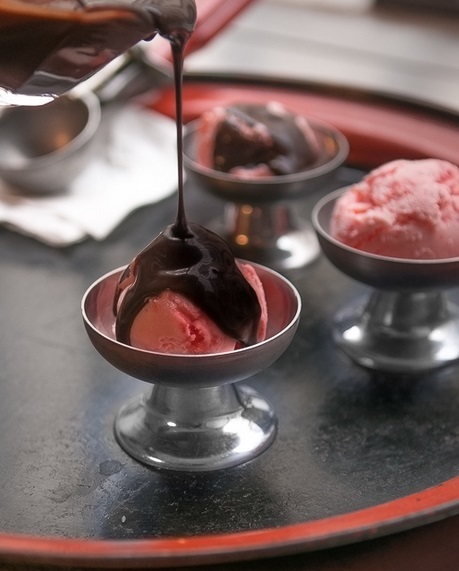 Serve warm in a little pitcher to pour over your ice cream. If not using immediately, cool completely, then pour into a glass jar and cover. Keeps up to one month (will thicken as it chills). You might find yourself eating it with a spoon out of the jar. To reheat, in a glass bowl or Pryex measuring cup, microcook on DEFROST for 1 to 2 minutes, depending on how much sauce. 2. Stir in the brown sugar, half and half, corn syrup, and salt with a whisk. 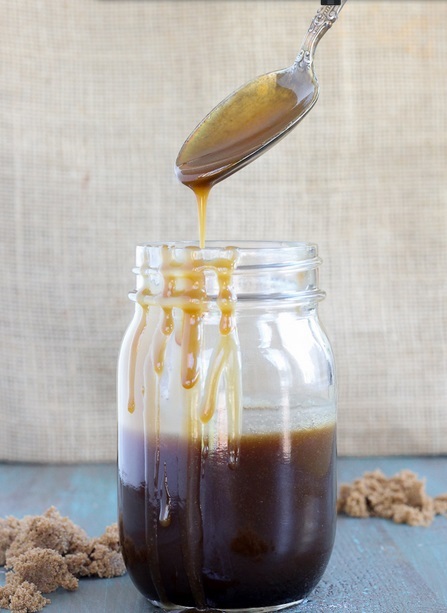 Stir with a wooden spoon to break up any lumps in the sugar. Cover with a piece of parchment paper. Microcook on HIGH for 3 to 4 minutes, stirring once with the handle of a wooden spoon until thickened and sugar is dissolved. The mixture will come to a full boil.